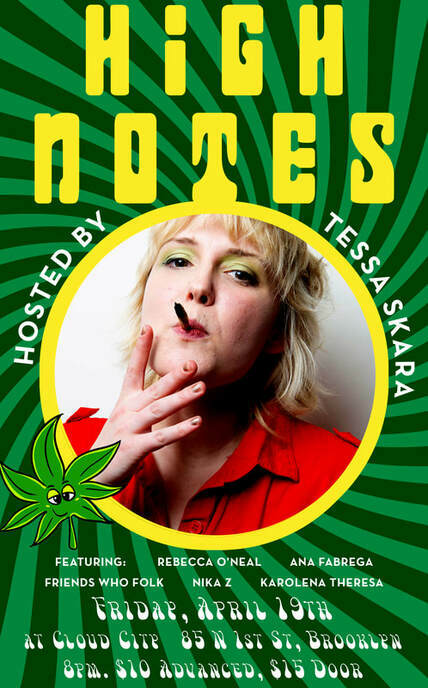 High Notes is a monthly high-energy, queer AF, and rock-n-roll-as-hell live musical comedy show hosted by the self proclaimed Rock Goddess of Comedy: Tessa Skara. Featuring a backing band of basement rockstars, High Notes is a show that brings together a revolving roster of stand up comedians, cabaret performers and musicians to belt out numbers on the meaning of life, love, and how kombucha tastes like salad dressing (which is why it's perfect!). If you’re looking for a night of live music, jokes jokes jokes, and moody acoustic ruminations on how selfish it is of your therapist to go on maternity leave then High Notes is the show for you! Friday, April 19. 8pm. $10 advance, $15 at the door. A live show featuring Bankrukt, continuing to be alive! Who is Bankrukt and how can they be stopped? The answer is: Shaina Feinberg, Jeff Seal, Chris Roberti, Chris Manley. And we can't! Come see what the fuss might have been about! Thursday, March 28. 8pm. $5. Come celebrate our 8th year of screening weird, eclectic & outlandish short films from NYC and around the globe. Art is Funny is Art... is a comedy show where all the performers are also visual artists. Not only will their work be on the walls of Cloud City - but also projected behind while they perform. Its an art show. It's a comedy storytelling show. Is an art comedy show. Saturday, May 4th. Doors/Art Viewing: 7pm, Show: 8pm. $10. Tickets available here. “The Best Ritual” is a raucous, two-woman comedy of idiots! Join us for “I Am Not A Visual Artist,” the debut art exhibition from comedian and writer Zach Zimmerman. The TimeOut NY Comic to Watch 2019 and The New Yorker writer leaves the jokes aside in first public art show with plenty of interactive surprises in store. The line between attendee and artist, maker and made, is blurred as the evening unites and ties strangers together to create art-ifacts which are added to the collection. Art will be on display for three nights only from 7-10pm. Follow on Instagram @thefagtory. Thursday-Friday, June 13-15th. 7pm. $10. Tickets available here.